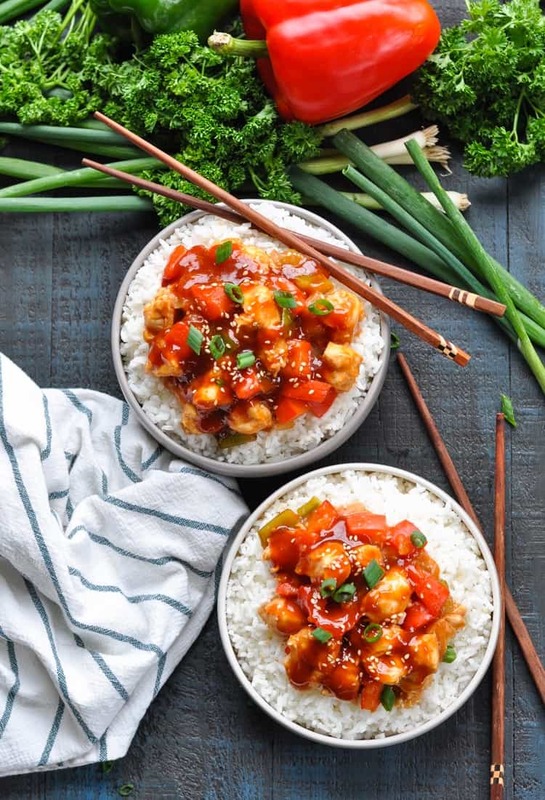 With just one dish and 10 minutes of prep, this Dump-and-Bake Sweet and Sour Chicken is an easier, healthier version of the Chinese restaurant classic. 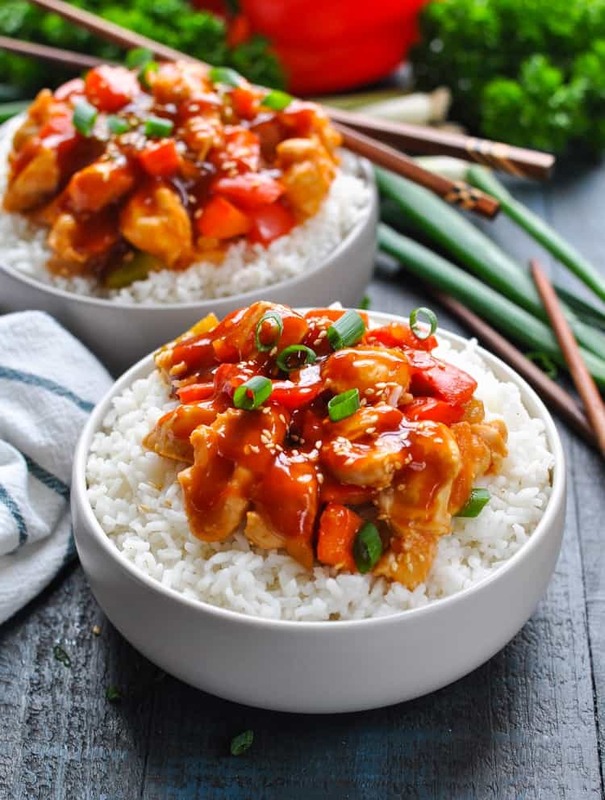 This Dump-and-Bake Sweet and Sour Chicken is a lighter, healthier version of the Chinese restaurant classic. 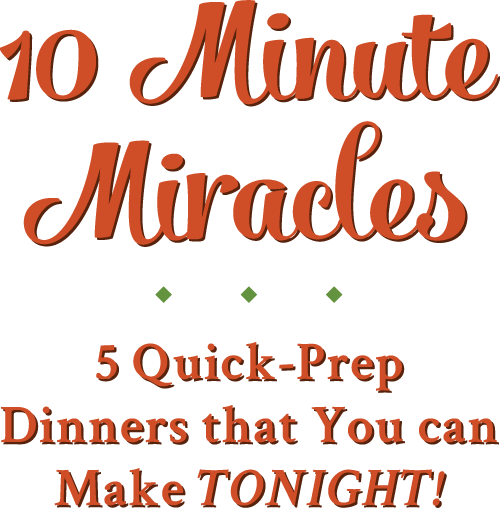 With just one dish and about 10 minutes of prep, it’s even easier than take-out! Hey, friends! 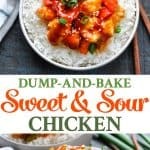 When I posted my recipe for Dump-and-Bake General Tso Chicken last winter, one of my kind readers asked if I had a similar dump-and-bake recipe for Sweet and Sour Chicken. I thought that was a great idea, so I got to work in the kitchen and finally arrived at this incredibly delicious version! How do you make Sweet and Sour Sauce for Chicken? The key to a tasty Sweet and Sour Chicken is obviously the perfect sweet and sour sauce! 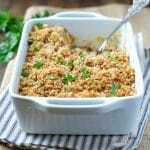 It needs to be thick (not runny and watery like some slow cooker recipes), and it needs to have the perfect balance of sweetness and tang. You don’t want so much sweet that you feel like you’re eating candy, and you don’t want so much sour that it makes your mouth pucker. It’s got to be juuuuuust right, and that’s exactly what we have here! 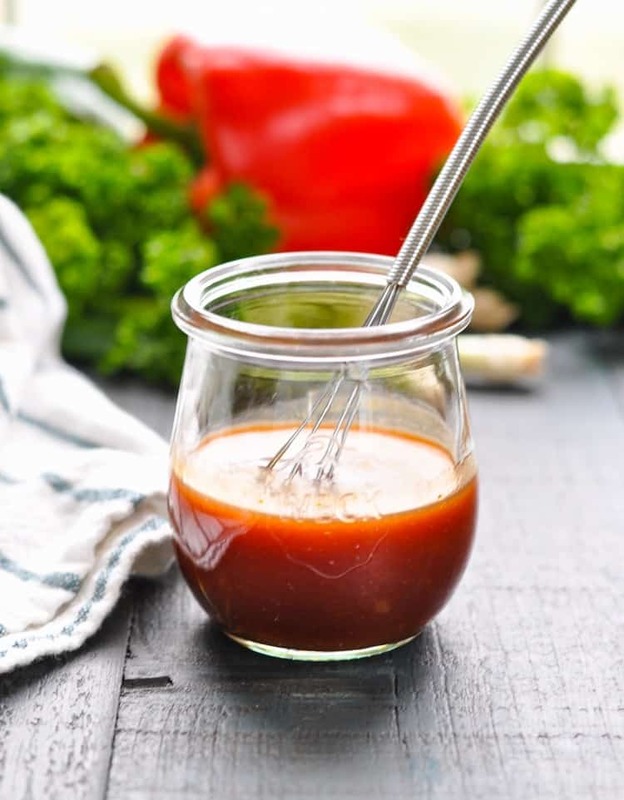 I’ve created an easy sauce that takes advantage of some basic pantry ingredients — so that you don’t have to make a trip to a specialty grocer! Once you’ve whisked together your sweet and sour sauce, your job is practically done! You just toss the sauce with some uncooked chicken and vegetables and pop it all in the oven. There’s no need to stand over a skillet to stir-fry your meal, and there’s no need to spend money on Chinese carry-out! 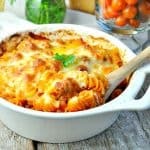 This is seriously one of the tastiest and easiest family dinners that you will find! What should I serve with the Baked Sweet and Sour Chicken? We love a side of white sticky rice — just like the Chinese restaurant serves! To get that same sticky rice texture, try using a rice cooker. It’s so simple to just flip a switch and have the perfect rice waiting for you a short while later. I can’t be trusted to babysit a simmering pot, so that little appliance has seen lots of use in our home! 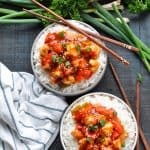 If you want a lighter option, this Sweet and Sour Chicken is also delicious served over cauliflower rice. You can pick up a bag (or two) of frozen riced cauliflower in the freezer aisle at your grocery store. The freezer bags go in the microwave for a few minutes and you’ve got the perfect base for a healthy dinner! 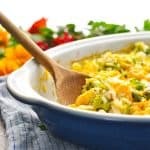 Are there any other favorite recipes that you’d like me to turn into easy, quick-prep dump-and-bake dinners? I’m always happy to accommodate another request, so please feel free to send them my way! Stir in onion and bell peppers. In a separate bowl, whisk together ketchup, vinegar, brown sugar, soy sauce, garlic and ginger. Pour sauce over chicken and vegetables; stir to combine. Bake, uncovered, for 25 minutes. Stir, return to the oven for 5-10 more minutes, or until chicken is cooked through and sauce has slightly thickened. If you find that your sauce is too thick when the chicken is done baking, you can add a splash of warm water (as necessary), and stir to thin. Serve over hot cooked rice, if desired. Garnish with sliced green onions and sesame seeds. Cooking Just for Two? 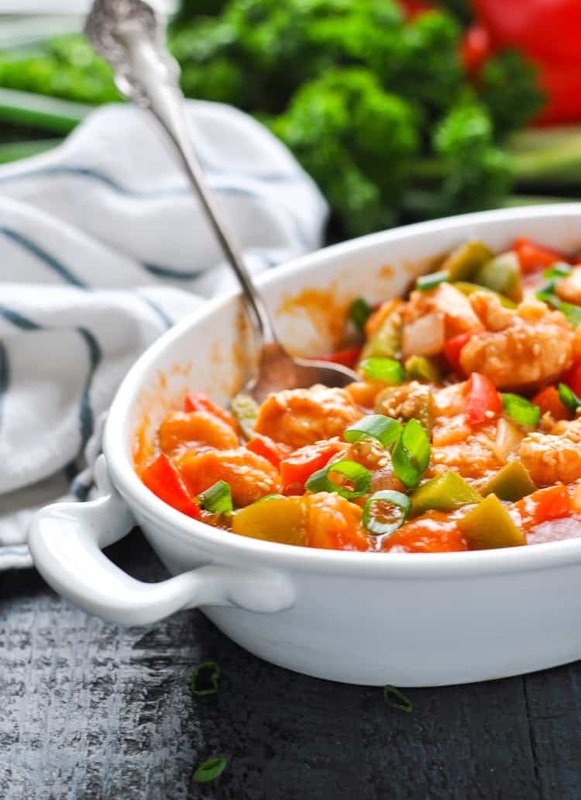 Cut the ingredients in half and prepare the Sweet and Sour Chicken in a 1-quart baking dish. The cooking instructions remain the same. 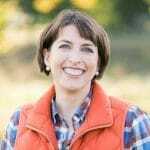 Hi Blair – thanks for all of the dump and bake recipes!! They work great for our church fellowship meals. Is it possible to do this sweet and sour chicken recipe in the crockpot? Yes, I think this dish would work very well in the slow cooker. The sauce might be a bit thinner than my baked version, since the condensation from the lid of the slow cooker will add liquid to the dish, but I still think that it will be fine. You can always add some additional cornstarch to the sauce at the end if you want to thicken it up a bit, too! Perfect! Thanks. When I make it I’ll let you know how it turns out. Thank you for these dump and bake recipes! I loved this one very much! This was fantastic! I added a can of pineapple tidbits during the last 5 minutes. Awesome, Buffey! I’m so glad that it was a hit! The pineapple is a delicious addition. I’ll try that next time! 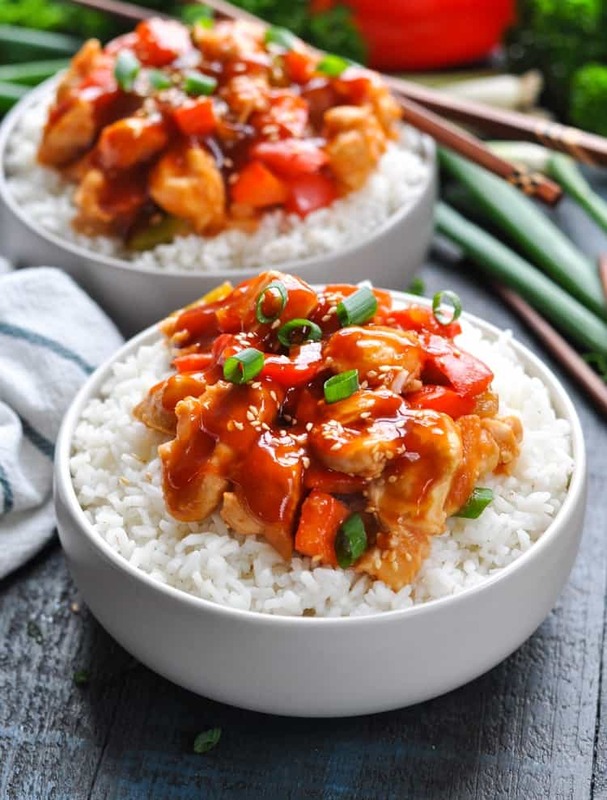 Sweet and sour chicken is a family favorite of ours! 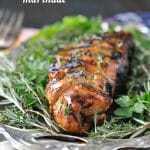 I’m excited to try your version which looks so easy and delicious! Thank you! Thank you for the recipe. My family and I loved it. I like that it is quick to prepare and has a good balance between sweet and sour without being to sweet like many others are. A winner in our house and we be making it again soon I am sure. I have just made this for my husband and 6 year old daughter. It was so easy and quick to make and turned out brilliantly. The sauce was perfect. Thanks so much for sharing.